I work with an 18-inch by 24-inch self healing mat. 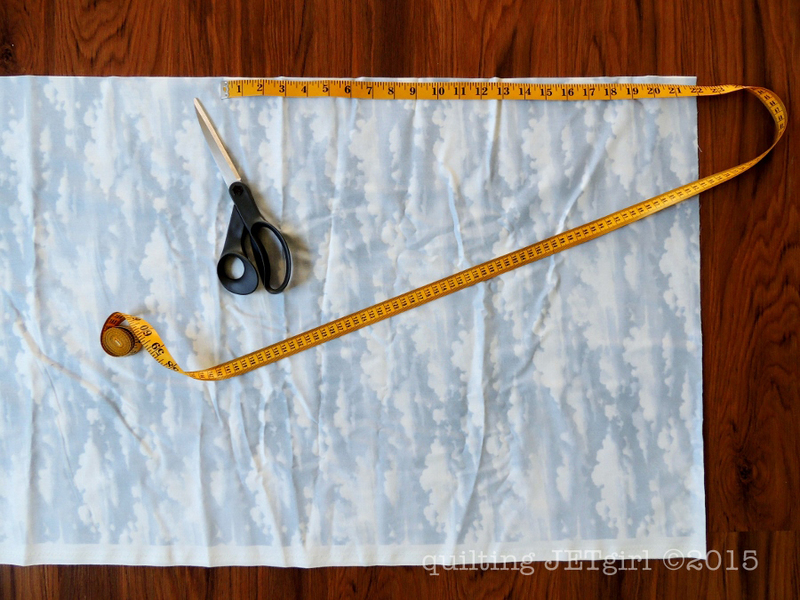 Occasionally I need to cut pieces of fabric that are larger than are easily accommodated by my mat, and I wanted to share two different methods I have used to overcome my limited space / mat size. I am currently working to make a large batch of bandanas for a customer. To do so, I am starting with 22-inch square pieces of fabric. However, cutting 22-inch squares on my 18-inch by 24-inch cutting mat is a challenge. To make my 22-inch squares, I improvised a little. 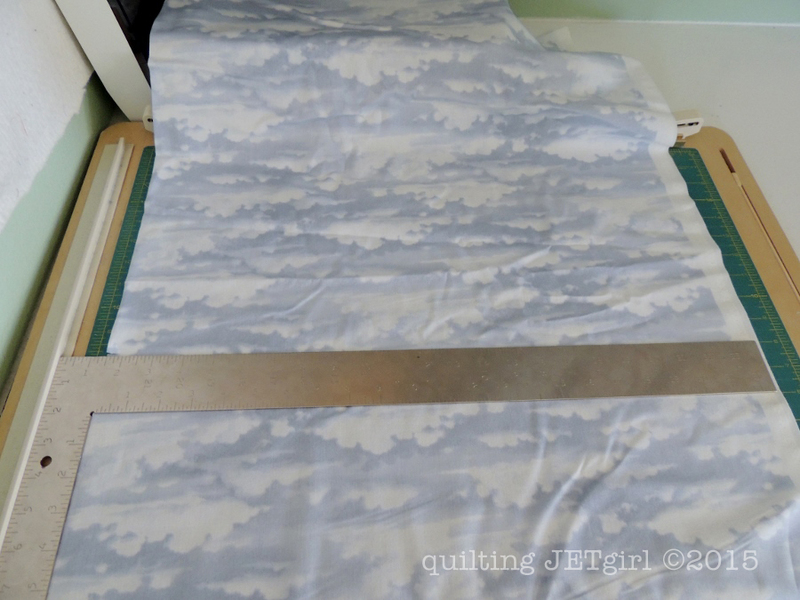 To start, I trimmed the top edge of my fabric square by lining up the fold of the fabric along a line of my cutting mat and trimming away the raw edge of the fabric. Next, I laid the fabric out on the ground and used my tailor’s tape to measure 22-inches down from the trimmed edge. I used my scissors to cut a notch at the desired location (22-inches down). I then transferred the fabric back to my cutting mat and made sure the fabric was laying as square as possible on the cutting mat by using the lines on the mat as a reference. I then cut the width of fabric as I normally would using the notch as the reference for where to cut. This gives me a 22-inch wide by WOF strip. I then lined up the fold of the fabric at the edge of the mat and trimmed off the selvage edges of the fabric at 22-inches. Because my mat is only 18-inches tall, I could not make the full cut, so I then slid the fabric up and finished the cut. Finally, I rotated the fabric so that the fold ran “east to west” across the mat (instead of the “north to south” from the previous cut) and trimmed away the very edge of the fold to create (2) 22-inch squares. This method works well and can go pretty quickly. As the bandanas are not required to all be the exact same size, a little bit of variability is OK. When I want a more precise cut of fabric, I use a slightly different method. For instance, I make a pretty popular large muslin archival bag to sell in my Etsy store. 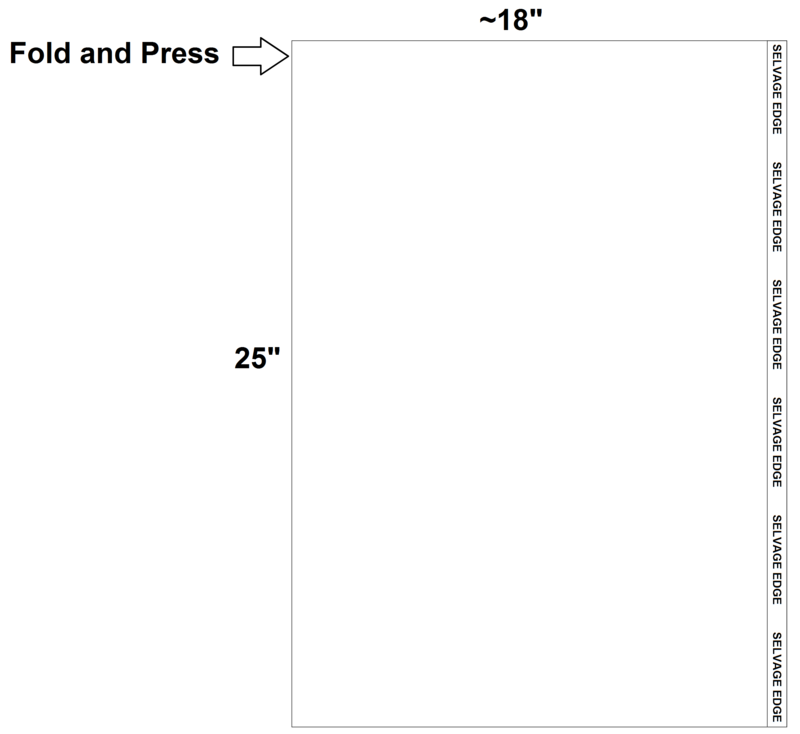 I work with a 36-inch wide width of fabric muslin, and I need two panels that are 24-inches wide by 32-inches tall. I start in a very similar manner: I square one edge of the muslin and then measure out a length by width of fabric cut. 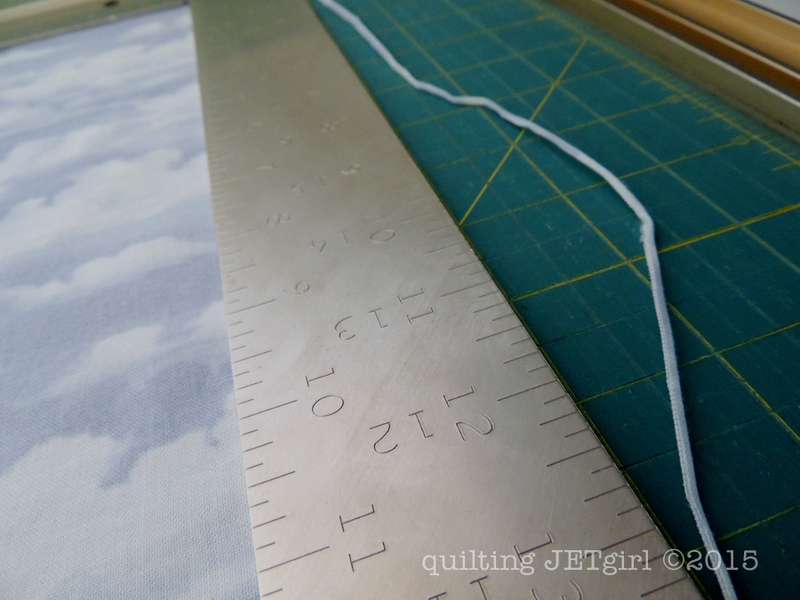 Instead of cutting to exactly 24-inches with my first cut, I oversize the initial cut by about an inch and cut 25-inches by width of fabric. I then open the cut muslin and press the muslin flat to removing the fold seam that exists from the fabric being put on the bolt. Once the fabric is pressed flat, I fold the muslin in half and press a very crisp fold down the center (this fold should be in the same direction as the fabric was originally folded on the bolt with selvage edges together). Next, I fold the fabric in half in the other direction, taking care to line up the pressed edges and create a second very crisp fold. 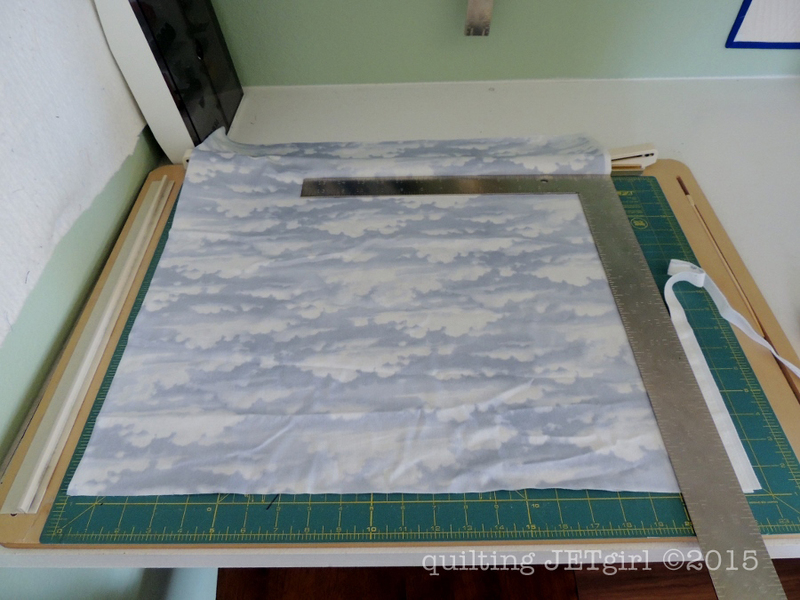 Now that the fabric is folded into quarters, I can place the fabric on my 18-inch by 24-inch cutting mat and carefully cut to my final block size. To do that, I place the second fold that I pressed at the top of the mat along one grid line and I place the first fold (that is doubled over on top of itself) to the left of the mat along a grid line. 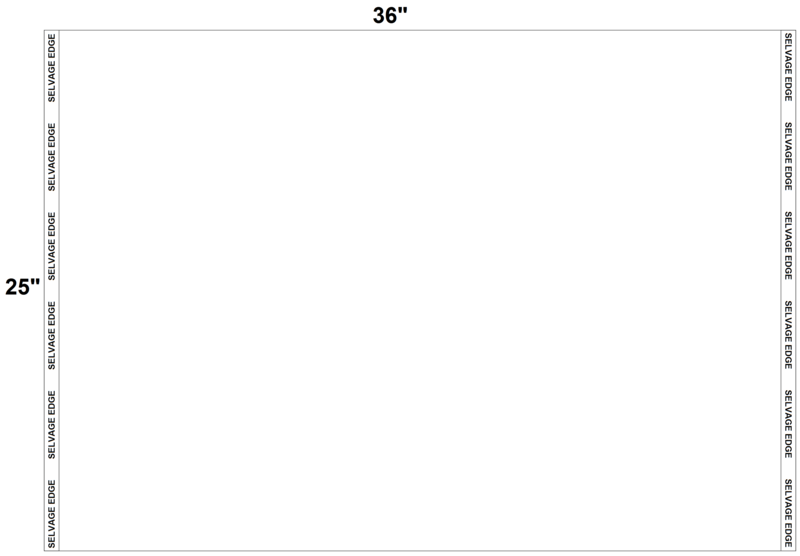 I then measure and cut 16-inches to the right and 12-inches from the top. 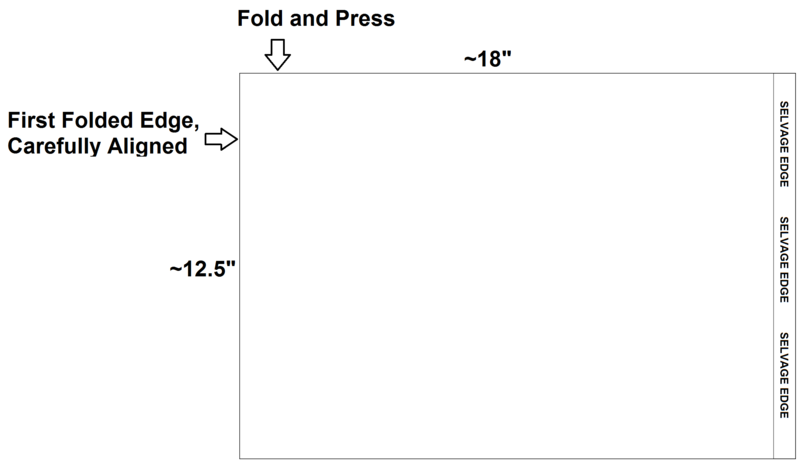 When unfolded, it will yield a 24-inch wide by 32-inch long block. Linking up with Tips and Tutorials Tuesdays. This is interesting Yvonne: I’m really impressed with your photos and diagrams in this post. I have a larger mat because I find when I fold fabric the cuts are often slightly off. 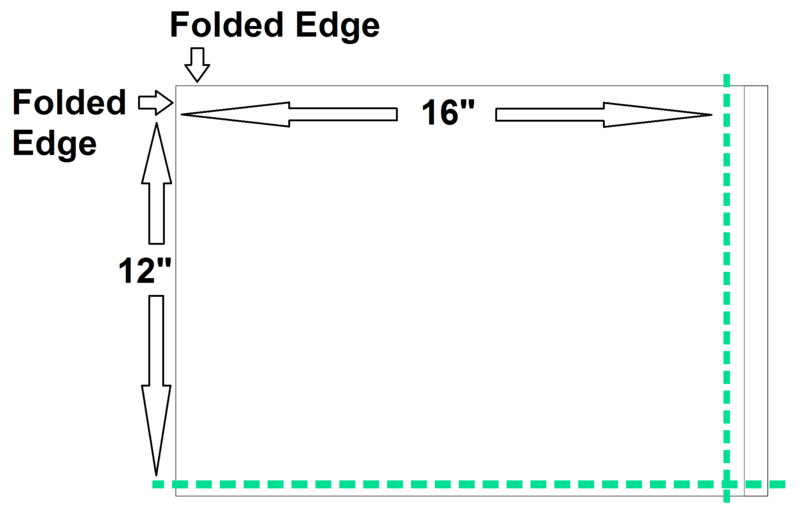 I think your tips would help me line things up better when cutting the first edge, on a width of fabric cut. I also take a smaller mat to workshops so I can see how the tips would be useful there. I’ve never heard the tip about ironing the fold. I think that would help improve accuracty. Thanks for the clever tips and the excellent photos/explanations! Happy Tuesday! Great way to overcome a smaller mat. It can be a challenge cutting large pieces on a too small mat! It can be done, you just have to be creative! Great tutorial! 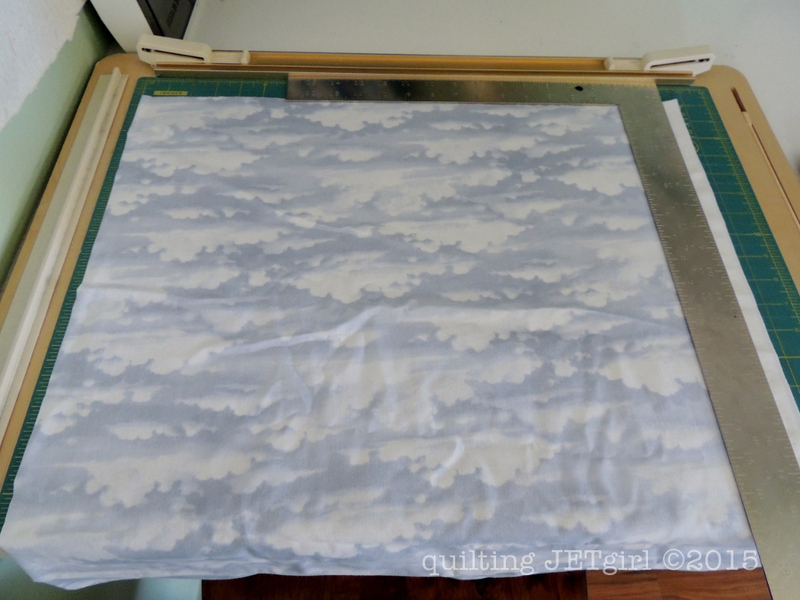 These are great tips, I have the same size mat (18″ x 24″) and always try to avoid big pieces (like for backings) because I can never get pieces cut straight and the to the correct size. I will have to try these tips. Both of these are great tips. I think my mat is 24 inches square so it works for most things I do. When I am faced with the challenge I tend to lean more toward option two. 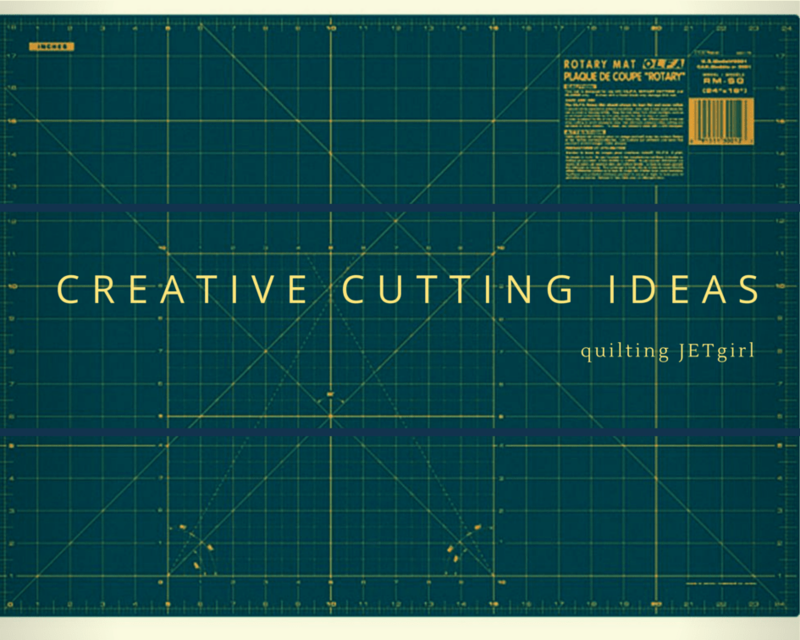 I take for granted that I have a large cutting mat (24×36 I think). Is there a lip/edge on the side of your table that you use with the carpenter’s square ruler? That is an awesome way to use that tool! Every time I see your carpenter’s square I think, “I gotta get one!” I too try to avoid large pieces of fabric, not because of the size of my mat, but because I can never get those folds just right – ironing them is a great tip. Thanks! I recently started using a drafting table my husband made when we moved into the first house we built in the 1980s. I was worried that the pencil ledge would get in the way until I saw your cutting setup in a previous post. I don’t use the raised edge like you do. I am well versed with a carpenters square as we have hands-on built five homes. Hubs is also an engineer and we are commercial general contractors. No tool use there, we both sit at desks and let the subs do the actual work. 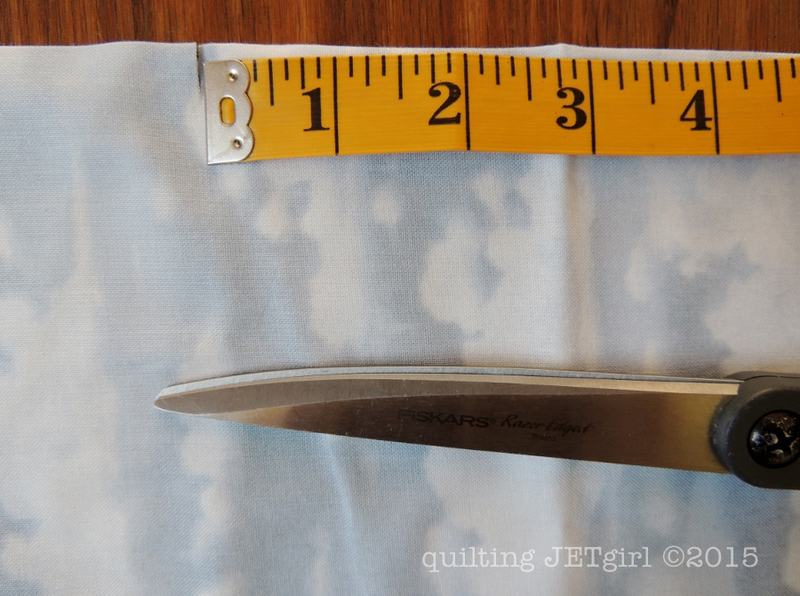 I just can’t wrap my brain around using a solid metal tool when I can see through a quilter’s ruler. Plus, our carpenter squares are filthy from being in the field. I do think if I ever got my husband to take on a quilting project he would drag one into the studio. You make it look very precise! I don’t often cut larger blocks but when I have in the past I have tried ironing halves/quarters to help and I’m sure I still remember some wonkiness! If I need to do any again I think I’ll have to follow your steps a bit more meticulously, I probably skipped some steps along the way!